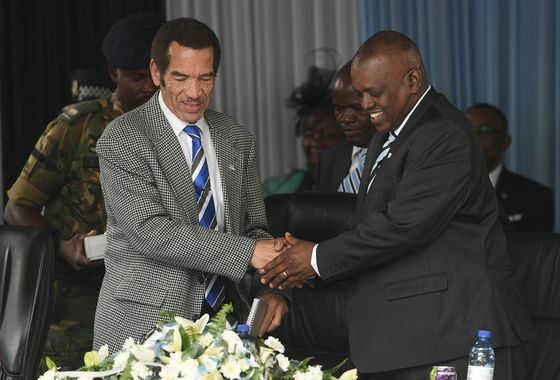 (Bloomberg) -- Former Botswana President Ian Khama slammed the ruling party after a candidate he backed withdrew from a leadership contest, saying it was rigged in favor of current president, Mokgweetsi Masisi. Former Local Government Minister Pelonomi Venson-Moitoi pulled out of the vote in Kang, 400 kilometers (249 miles) northwest of the capital, Gaborone, leaving Masisi to stand unopposed. After she made a failed bid in the High Court to delay the contest, she said she stood down because she was treated unfairly and her supporters were intimidated. Khama, who left office a year ago, has disagreed with Masisi, who was his vice president, over plans to reverse some his signature policies, including shortened hours for outlets that sell alcohol and a hunting ban in the nation with the world’s biggest population of elephants. He called the steps a “gimmick” to win votes in what’s expected to be a tightly fought national election in October. Khama, the son of Botswana’s iconic first President Seretse Khama, said he didn’t travel to the meeting in Kang because he didn’t want to legitimize a “farce.” Venson-Moitoi would have won a fair contest, he said. The ruling Botswana Democratic Party’s popularity has declined in recent years to a record low of 47 percent of votes in the last election in 2014. Masisi’s re-election as party leader is set to be confirmed later on Friday. Party spokesman Kagelelo Kentse didn’t answer a call to his phone.